B2B buyers and sellers face significant challenges in linking e-commerce systems to business management software, based on an analysis of companies profiled in the first-ever and newly published 2015 Guide to B2B E-Commerce. Christian Art Gifts had a functional home-grown e-commerce site until early 2014. But the B2B e-commerce site did not integrate well with its Microsoft Dynamics financial and inventory management software, says company owner Heinrich Johnsen. That made it difficult to update inventory availability on the e-commerce site as it processed online orders, Johnsen says. Christian Art Gifts, a wholesaler of art and gift items, carries about 2,000 SKUs. It offers a constantly changing mix of products ranging from books and day planners to necklaces, leather wallets and coffee mugs. Its products carry a Christian or inspirational theme, such as with imprinted crosses or terms of hope and encouragement. Johnsen, a former business and technology consultant at an international consulting firm, at first figured he would find a new e-commerce platform and customer relationship management software to plug into the Dynamics application. But that didn’t go as easily as he had hoped. “I realized it would be a very complex integration,” he says. As a B2B e-commerce site, with a wide range of customers from major retail chains like Barnes & Noble to small, independent merchants, Christian Art Gifts required tight integration between its e-commerce and accounting and inventory software. That is necessary, for example, to show each business customer the price discounts it has negotiated at each tier of order volume. Johnsen opted instead for a new system from NetSuite Inc., SuiteCommerce, which provides an e-commerce site integrated with NetSuite’s business software for managing financial, inventory and other records. Christian Art Gifts is developing its new NetSuite platform in phases. The site now accommodates small purchases by individual consumers as well as bulk orders by business customers who can log in to view their contract pricing. Christian Art Gifts is like many B2B companies that want to use e-commerce technology to provide an enhanced customer experience that parallels the B2C experience, but that face significant challenges in doing so, ranging from cultural change to cost. And while many companies selling to other businesses, government agencies and educational institutions—essentially manufacturers, distributors and wholesalers—are wrestling with integrating e-commerce systems with business management systems, many more have yet to move beyond the most basic e-commerce capabilities, experts say. But a growing number of B2B companies are realizing the opportunities of e-commerce and are making a business case for it, Sheldon says. “They are bringing in a vice president of e-commerce and implementing next-generation e-commerce platforms,” he says. B2B companies are adding e-commerce and integrating an array of software in order to make it easier for customers to renew or place orders with a few clicks. That frees up call center agents from handling routine reorders and lets them concentrate on cross-selling and upselling. It also frees company sales reps from handling standing reorders and concentrating on top customers that place big orders for new products. Further details on how B2B companies are integrating e-commerce systems and working with systems integrators can be found in the 2015 Guide to B2B E-Commerce. The guide covers how and why companies develop their own e-commerce sites with special features catering to the needs of their customers, such as personalized displays of online content and pricing tied to customers’ purchasing needs and contract terms; trends in B2B e-marketplaces and procurement networks, where buyers can connect with large numbers of suppliers; and the development and use of procurement software that enables companies to manage how their corporate buyers purchase products and services from authorized suppliers. 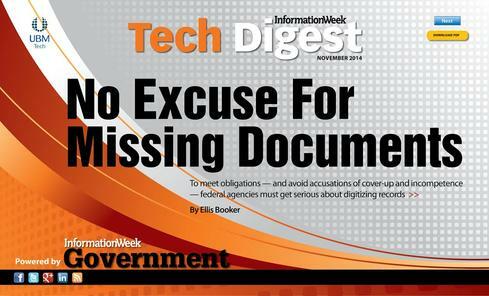 Download the entire November Tech Digest of InformationWeek Government, distributed in an all-digital format (registration required). Are your agency's documents digitized, securely stored, and easily retrievable by those with the right clearance? If not, you're about to run afoul of regulations -- and you're missing an opportunity to leverage some high-profile events to get buy-in for better, more secure data management. First, there's the ongoing saga of Edward Snowden, the former intelligence contractor for the National Security Agency who leaked thousands of classified digital documents to media outlets last year. Then in June came disclosures during congressional hearings that the Internal Revenue Service could not locate an untold number of emails. The IRS said Lois Lerner, the former head of the IRS division that processes applications for tax-exempt status, and other employees had archived data to their local hard drives when their email accounts became too full; the agency limited employees to 500 MB of storage on its Microsoft Exchange servers. The archives were lost when the computers' hard drives crashed, the IRS said. In both cases, don't blame digitization -- blame poor data management practices. "Throughout this review, the IRS has found no evidence that any IRS personnel deliberately destroyed any evidence," said the agency in a statement. "To the contrary, the computer issues identified appear to be the same sorts of issues routinely experienced by employees within the IRS, in other government agencies and in the private sector." In the Snowden case, security experts point out there was no legitimate reason for someone in his role to be allowed to download caches of sensitive documents. Of course, government agencies are different from private sector IT organizations in one crucial way: They might not have autonomy to set policies as they operate under a web of city, state, and federal rules. Indeed, that's part of the problem, according to one person familiar with government IT deployments. "The state can't mandate [solutions] to cities, and the feds can't mandate to the states," says an executive at one software vendor who deals with government. Funded mandates have a better chance of being implemented at lower levels than unfunded ones, but even this isn't a sure thing. These problems arise from a tradition of bureaucratic autonomy in the United States and aren't as big a problem in, for instance, Europe, he says. This view isn't necessarily shared by other IT vendors -- at least, not publicly. Storage and document management vendors with government practices we spoke with say they see strong prospects to sell products for long-term, secure data preservation. The Obama administration is signaling a long-term commitment to digital data by appointing former Google exec Megan Smith as chief technology officer of the United States and putting former Google engineer Mikey Dickerson at the helm of the new US Digital Service. The USDS is charged with, as then-federal CIO Steve VanRoekel put it, "removing barriers to exceptional government service delivery and remaking the digital experiences that citizens and businesses have with their government." The writing is on the White House wall that the future is digital. However, for now, federal IT pros face a technology and policy patchwork that will test IT pros trying to lead the transition. We have a reason to celebrate at ServiceDesk Plus. And, we want to do it with you. Join us here.